Many students use careers fairs as a great opportunity to have a look at the companies attending and get a feel for the career they intend to pursue. However, they can be used for more than that! In today’s competitive graduate job market, candidates must look at all the avenues in which they can give themselves an edge over other applicants. Careers fairs present one of the best and most underrated opportunities to obtain such an advantage for your application. 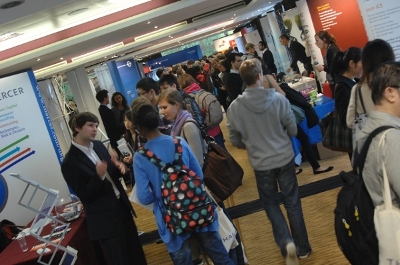 Careers services will provide an online list of the exhibitors (aka the fair guide!) before an event This gives you the opportunity to read up on the firms that are going to be attending. Be selective – a careers fair is not supermarket sweep. You don’t need to visit them all. Concentrate on the employers you’re interested in and think of some good, insightful questions to ask. This will show you’ve done your research and are a serious candidate. What would help my application really stand out? How do you see this job/sector changing over the next few years? What is the best part of your job/working for X company? Another key to making a good first impression is how you look. Although careers fairs do not operate official dress codes, you should still try to appear professional in both attitude and appearance. The first thing they will notice about you is your appearance, even before you utter a single word, so aim to look reasonably smart. And avoid other distracting behaviours when you’re talking to recruiters: chewing gum, drinking coffee or answering your phone can all make you seem rude or sloppy. This isn’t a job interview, but it could be the precursor to one so try to create a good impression. Careers fairs will all have a specified start time and it is very common for students to take the mentality of ‘the fair is on for hours, I will just go later this afternoon’. This can be a big mistake as recruiters at these events are likely to speak to hundreds of students each day and at peak times it can be difficult to speak to any one candidate for a significant period of time. By turning up early you give yourself the best chance to speak to the individuals and companies you want to for a bit longer. Remember, the longer that you get to speak to somebody the better your chances are of making a lasting impression. If you’re feeling particularly nervous and hate networking, it might be worth “warming up” with some of the recruiters you’re less interested in. This doesn’t mean wasting their time, just spend a few minutes with them to get into the swing of asking questions. You’ll soon get a feel for what works. Try to get contact details in order to follow up after your initial introduction. The careers fair will be a very busy day for the recruiters, so a follow-up is vital to getting your foot in the door. The best way to do this is to exchange business cards. Business cards aren’t just for business execs! Think about getting your own. They don’t have to be fancy and multi-coloured. Understated and clean gives a great impression of maturity and confidence. A business card is something tangible you can leave and it may help later on when HR asks which candidates stood out. They’ll have your details to hand. Conversely, it’s important for you to collect recruiters’ business cards as this enables you to open a dialogue and ask further questions (or just a courteous ‘thank you’) after the event. Impressions count – first and last! At careers fairs there may be a mix of HR representatives and graduate recruiters attending the event. Make the right impression and you could be flagged as a potentially strong candidate. Occasionally students are fast tracked to a more advanced stage of the recruitment process off the back of careers fairs, or invitation only events later on. Put yourself in the best position by making a positive first impression and an even stronger final one. For more information on graduate jobs check out Grad Diary and use the Graduate Recruiter A-Z to help you research companies further. You can also. and get some invaluable insight by reading our Insider Interviews. Tags: Employers, Fairs. Bookmark the permalink.